Converting a DBF database to a plain text file is a seemingly easy task that still has a lot of caveats. DBF Viewer 2000 delivers fast and reliable way to effortlessly convert literally any DBF file to the text format. The program supports extra large files, works with DBF files created in any framework including dBase III, IV, FoxPro, Visual FoxPro and others, and supports automated processing thanks to command line operation. First of all, open the DBF file you want to convert in the program and run the Export command from the menu. Then, specify the file name of the output text file. The data from the source DBF will be saved to that file. As you can see on the picture above, you can select which fields you want to export and arrange the remaining fields in the arbitrary order using the arrows. There are also a number of data modification options such as skipping deleted records or enclosing text fields in quotes – useful when text fields may contain spaces or special symbols. Click OK when done. The program will rapidly convert the DBF to text. 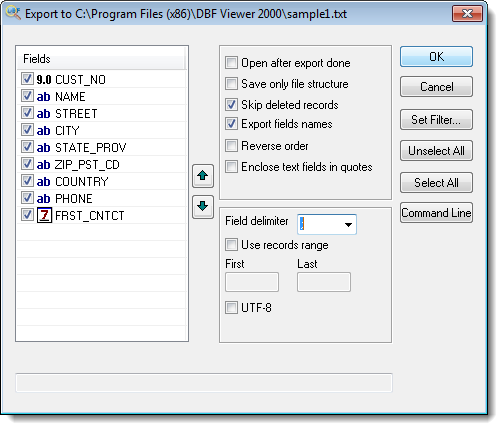 One of the biggest advantages of converting with DBF Viewer 2000 is its support for command line operation. Conveniently, you don’t even have to compose the command line string yourself. Simply select the options you need once and click the Command line button to get the command you can use later. Do you need other options for exporting to Text format?